The defence, the ones we all use (go on, admit it) will be the usual rubbish about working late, chores, social life and that hoary old chestnut (drum roll please) Writers’ Block. Piffle. Codswollop. Writers’ block is a fallacy (she says with a marginally psychotic glint in her eye) and there’s a way around it called PROCRASTINATION. PROCRASTINATION is great. It’s fun. It opens doors to new experiences. It can be picked up and put down at will, without rancour. It’s easy to get the hang of and everyone can do it. PROCRASTINATION can take many forms but the most insidious, the most dangerous, is the form where you think you’re actually achieving your goals. It’s tricksy, being bad for your project, but good for the brain’s misguided writing erogenous zones. As Charles Baudelaire – not Verbal Kint – once said: ‘The greatest trick the devil ever played was convincing the world that he did not exist.’ I hear you, Charlie-boy. Like some other man said, it’s the Devil wot plays the best tunes and PROCRASTINATION is a gosh durn fine one, dagnammit. I love PROCRASTINATION – and am using thirteen hour days at work as an excuse. There are ideas for stories, mere ghosts fleeting across the back of my mind. Even my dreams are about writing; in one I had a fabulous plot all written down, a sure fire ‘big break’ story of such staggering simplicity it was a miracle no-one had thought of it before. Then I woke up – all I remember was an ever reliable Moleskine notebook. 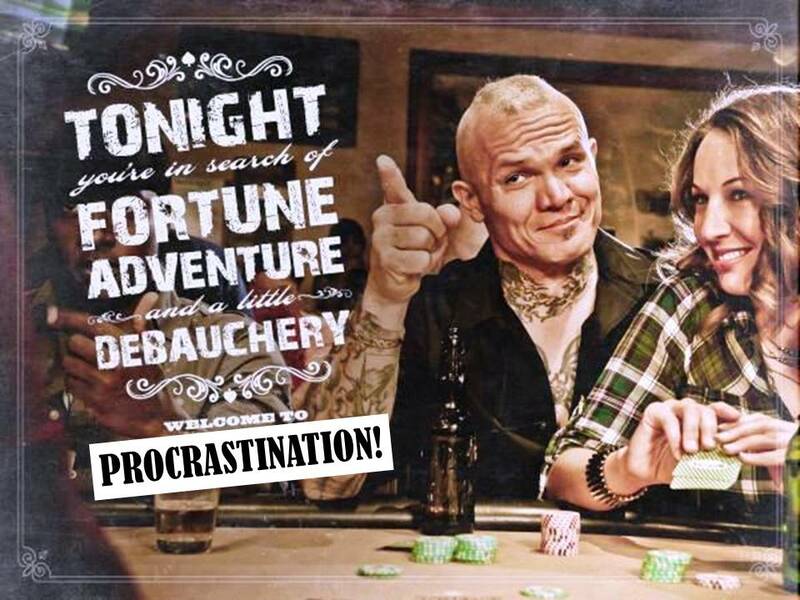 PROCRASTINATION can be a good thing. What matters is what you do with it – as long as you’re writing something each day then skills can still develop, progress can still be made. If you feel stuck in a rut, or find it hard to break free, you have choices: you can knock it on the head, play it to your advantage or let it rule you. Being a bit OCD on the ‘Who runs my life’ front, while also being far from perfect, I vote for the first two. The next few posts cover some of the methods I use to battle PROCRASTINATION into submission and you might manipulate it to your own advantage.